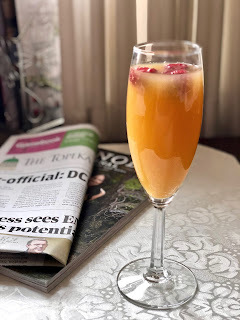 Each Friday, my fellow food bloggers and I feature a recipe from one of the Gourmet Live 50 Women Game Changers list. This week’s selection is one of my favorites—Ina Garten. 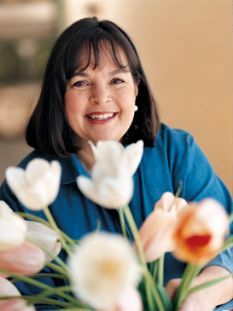 I’ve enjoyed her show, The Barefoot Contessa, for years. My husband, Michael, even knows who she is after just a few months of marriage. On Friday I will write more about why I enjoy her cooking style. I’ve made a couple of her recipes in the past. In fact, my friends raved over her Outrageous Brownies. But when it came to selecting a recipe for this week, I couldn’t decide between two that sounded wonderful. So I made one for dinner tonight, and I’ll make another one for Friday. Tonight’s dinner featured Chicken Piccata. It was wonderful! The lemon-butter sauce not only tasted delicious on the chicken, but would be great on fish as well. The Picky Eater liked it—he cleaned his plate of every last drop and said I could make it anytime! I served it with rosemary roasted potatoes and a salad of cucumbers and tomatoes. Stay tuned for Friday, when I’ll make Ina’s Mexican Chicken Soup. Preheat the oven to 400 degrees F. Line a baking sheet with parchment paper. Set aside. Place each chicken breast between 2 sheets of plastic wrap or in a zipper bag. Pound them with a rolling pin or meat tenderizer until they are 1/4-inch thick. Sprinkle both sides with salt and pepper. In a shallow dish (I use a pie pan) mix the flour, 1/2 teaspoon salt, and 1/4 teaspoon of pepper. In a second second dish, beat the egg and 1/2 tablespoon of water together. In a third dish, place the bread crumbs. Dip each chicken breast first in the flour, (shaking off the excess) and then dip in the egg and bread crumb mixtures. Heat a large skillet over medium heat. Add 1 tablespoon of olive oil. Place the chicken breasts into the hot skillet and cook for 2 minutes on each side, until browned. Remove them from the skillet and onto them onto the baking sheet. Bake for 5 to 10 minutes while you make the sauce. For the sauce, wipe out the saute pan with a dry paper towel. Over medium heat, melt 1 tablespoon of the butter. Add the lemon juice, wine, the reserved lemon halves, 1/2 teaspoon salt, and 1/4 teaspoon pepper. Boil over high heat until reduced in half, about 2 minutes. Remove the skillet from the heat and add the remaining 2 tablespoons of butter. Swirl to combine. Discard the lemon halves. Serve each chicken breast on a plate with the sauce spooned over the top. Garnish with a slice of lemon and chopped fresh parsley. I love Ina Garten. I have at least five of her cookbooks. Followed this recipe to the "T" except I added capers to the sauce. It was sooooooo good! I'm glad you enjoyed it! Capers sound like a wonderful addition.